January 2013: I am sitting in my very palatial home in Bangalore, India staring at the vast amount of junk amazing knick-knacks I have accumulated over six years. It is quite unbelievable that I quit my job 2 months ago and now sitting on a pile of things that I am selling online at throw-away rates. Well, we are moving countries! (Cue: panic, stress, deep breaths…) We are moving to London and have to pack up our lives that we have painstakingly built over the past six years. Not easy to do that, let me tell you. Every object I pick, has a memory… “Oh my god! we bought this figurine from that tiny village in Tamil Nadu, remember?”… is a usual response. But it has to be done. We pack our lives in 2 suitcases (and 2 to-be-shipped boxes, mainly consisting of shoes and bags…) and take that BA flight. I have come to love Bangalore but I know this next chapter will be supremely exciting.. 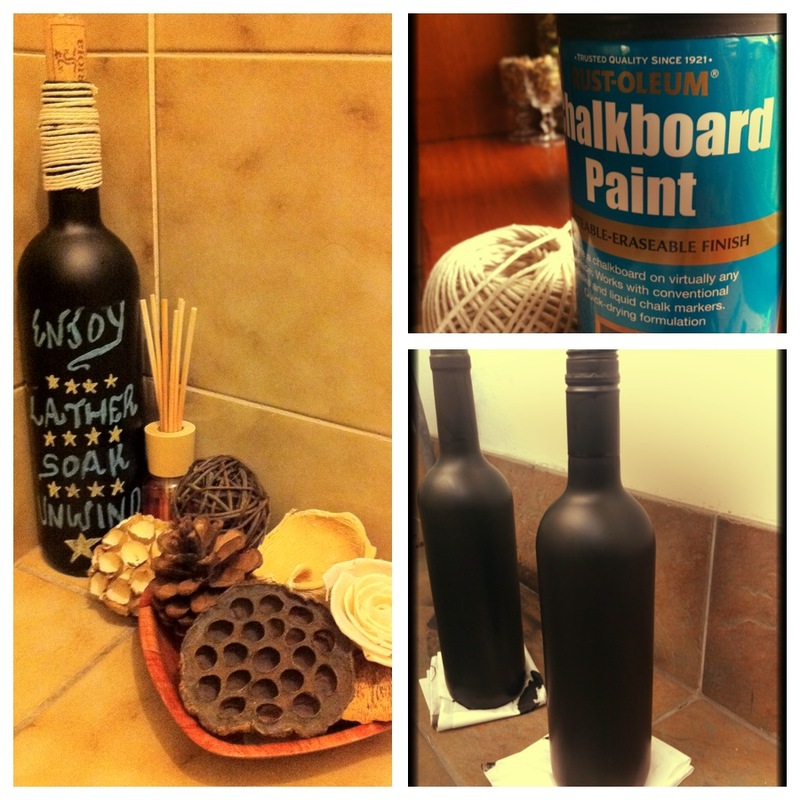 I spray-paint the innumerable wine bottles (what can I say, wine became my companion in this jobless situation!) and write little notes with chalk. Thank you, Pinterest for the inspirations. I go browsing the nearby farmers’ markets and buy cheap flowers. Charity shops are my best friends. From cutlery to vases and candles, I buy them all, desperately trying to recreate the homely feeling that I missed. I also spend countless hours searching for jobs. I am lonely in the city, barring a handful of friends (who obviously would not entertain me in the middle of the week) and cousins in faraway towns, who I meet and feel grateful for over weekends. But it is me against time on weekdays. I am not kidding when I say, I apply to over 20 jobs a day. I am an accomplished communications professional and after 6 years in the industry, I am so desperate to find something that I am willing to even take an internship. Well, Mr. idiot, if you don’t give me a UK experience, how the hell am I supposed to get it?? Upwards and onwards, I continue my quest. I also take this time to see the city that is London. June 2013: I HAVE A JOB!!!!! I jump up and down and cry on the phone to my father when I hear the news. I buy some flowers and smile at every stranger on the road till I start getting the are-you-mental look. I take the husband for an elaborate meal (of course with his money.. but nevertheless). Something else makes me happy. Even though the past four months have been tough with over 100 job rejections, I also got the chance to see this city and absolutely, completely, fall head over heels in love with it. Sometimes when i felt miserable, I would get dressed, wear the warmest clothes and step out. I would pull out my Google maps and just walk everywhere. Once, I started walking from Bank tube station, over to St. Paul’s, across Millennium bridge to Tate Modern and down along the river to Borough Market back up to Liverpool Street. Best walk of my life. Once, I left home at 8am and decided to explore the antique markets, that I even blogged about! 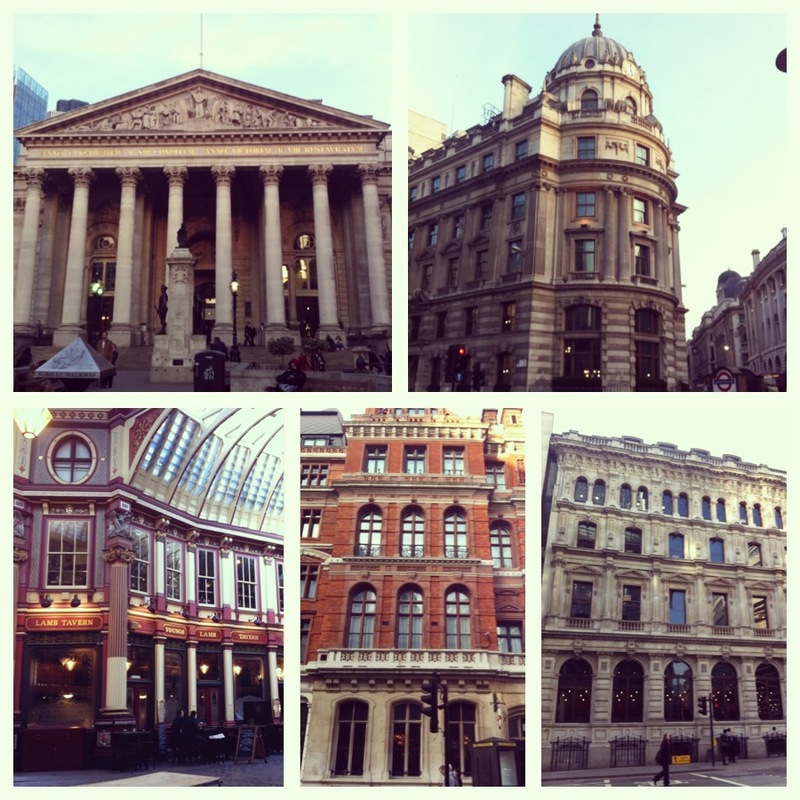 My perception of London and its people changed faster than changing underground tube lines. 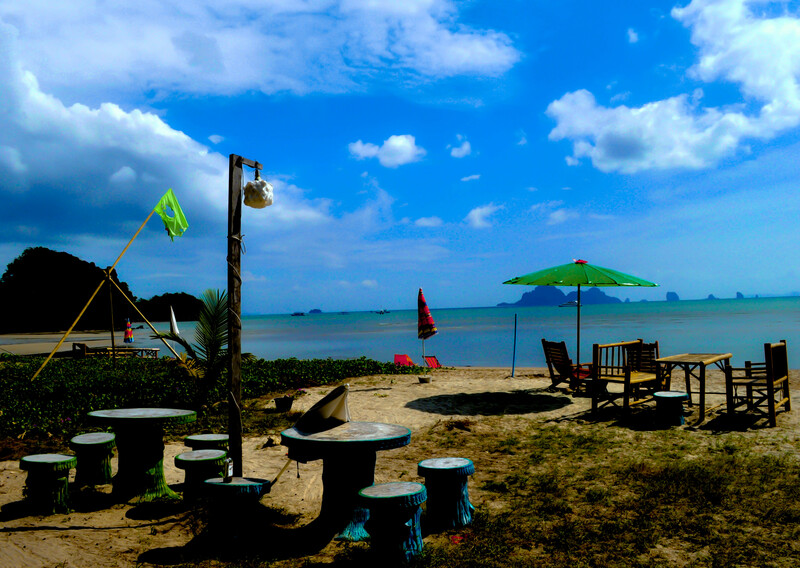 People are warm, very helpful, love the city and guard its culture fiercely. The city is inviting, has an incomprehensible amount of history and if you walk around the city without constantly looking up at the building façade, you are missing something in life. Randomly you will come across a plain-looking house with a placard claiming a famous poet/artist lived here. Out of nowhere, you will come across a hidden pub in a cobbled alley that looks as inviting as its beer. I spent innumerable hours browsing London’s many free art galleries and museums. I also turned the big 3-0 and decided to treat myself by wandering around the Natural History Museum and the V&A museum. I also got a massive surprise from the family… so blessed! Oh! did I mention, I camped at Wimbledon? What an experience! August 2013: I am generally in a happy state of mind. I have a job which is lovely. I have the BEST colleagues in town. No seriously. BEST. I have made amazing connections at work, found my long-lost twin (only that she is blonde and English) and made a network that is hard to come by. I spend my days working with colleagues to fight for the rights of UK consumers (I worked for the Consumer Association of UK) and spend many hours being awed by the campaigning work we do. I come from a background of mostly technology companies and to be in the same room as people who take up a challenge against the government and ask them to end dubious mobile phone practices, is inspiring. I spend my evenings laughing-till-stomach-cramps-happen over wine in a crowded old-man’s-pub. I get introduced to a million amazing experiences with these girls (remember the BEST colleagues i spoke about?) and thank someone up there, every single day. 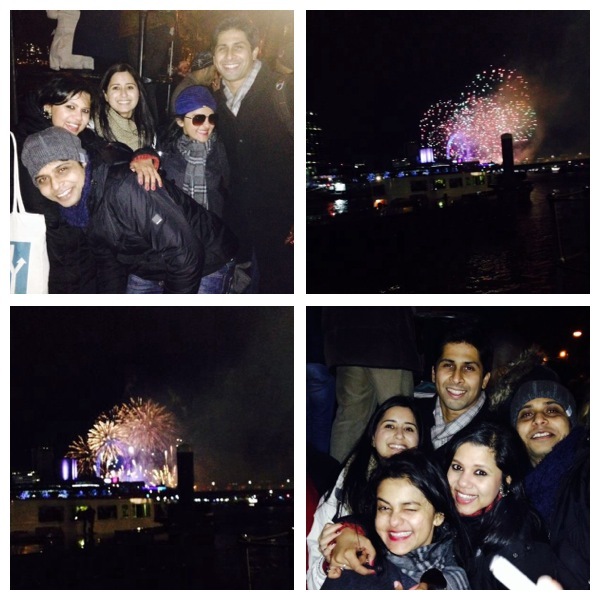 December 2013: Saw the fireworks of London on New Year’s Eve with the people that mattered. 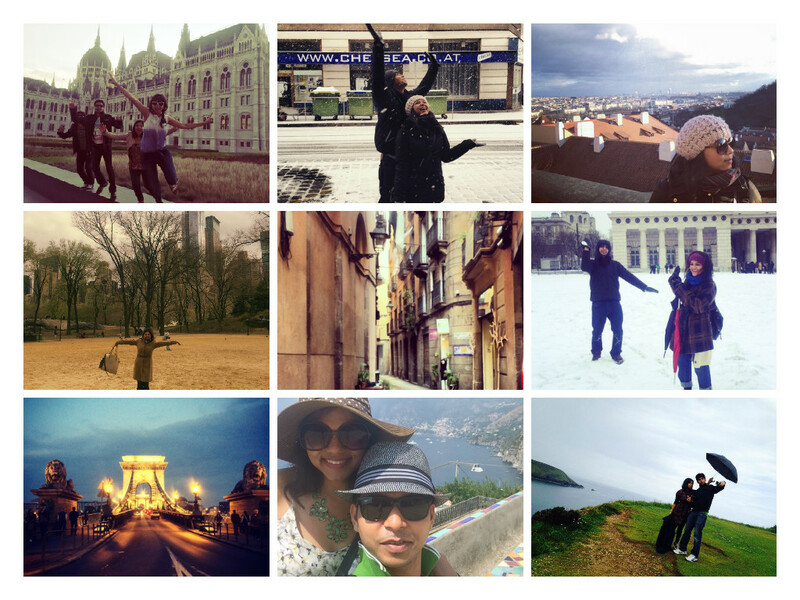 Have made 2 trips around Europe and felt generally a bit more settled in life. Going ice-skating at the Somerset House and getting bruised in special places. Of course laughing till nothing mattered. Watching Lion King and crying in the first act because I couldn’t believe I was watching something that I dreamt about since childhood. Still love charity shops but now I look around John Lewis and buy little something specials.. 🙂 Cooking a hearty Christmas Day lunch at home and lounging on the couch nursing fat bellies, dressed in Christmas jumpers. 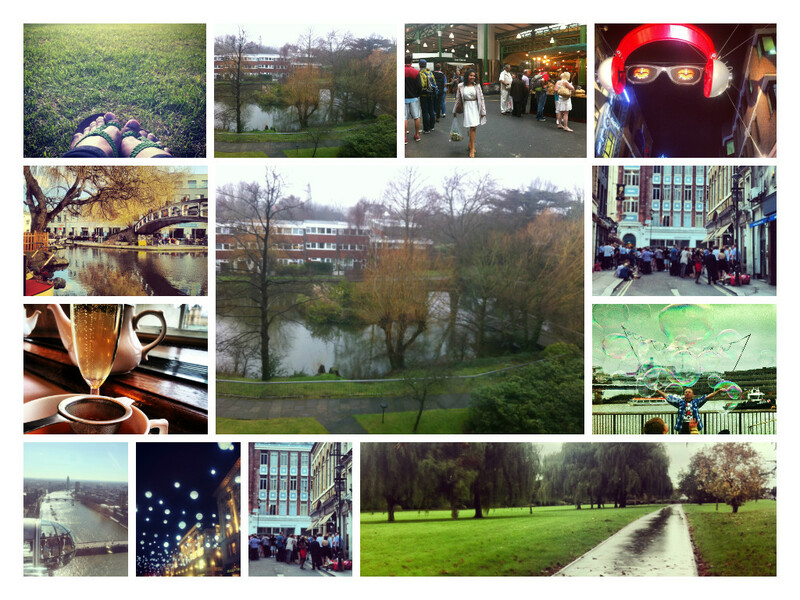 April 2014: I feel I am a somewhat expert on London. I recommend restaurants, experiences and plan weekend activities for the husband and myself. London got the husband and I closer than before, having to spend many weekends as just us, made us treasure what we have and experience new cultural outings. Sunday roasts, exploring neighbourhoods, going for a long walk on Saturdays, signing up for pop-ups and shows.. we do the whole shebang. We are travelling to the US, east coast to be precise and I am busy planning the works – being the planner that I am, I have a spreadsheet going. We are seeing family and friends and are very excited as this is my first footprint in the continent. Came back to London and did not enjoy New York as I thought I would. Everyone said it is amazing and all I kept thinking while I was there was – oh! London is so much better. Maybe it was just wrong timing but I think I would pick London anyday. And just when I thought it is all amazing/rosy, I got told that I am being made redundant at work due to budget cuts. I feel like my world crashed around me. I cry to my mum on phone. “Did my luck just run out?” After a couple of days of whining and feeling bad for myself, I picked myself up and sent my résumé out to the universe. Have to say, my now ex boss was an absolute gem. Not only did he help me with interview questions and tasks but let me take any several hours off to get that job. Getting shocked looks at work of how-can-they-make-you-redundant made me feel blessed that I made some sort of impact in the one year I worked there. June 2014: Thank god for parents! My parents are visiting. Mum cooks exotic dishes every day and I feel like I am 22 again and my mum is in town to help me fix my life. The family of 5 (including the little sister who moved with me as well) take off to Scotland for a road trip. Best decision ever to get away. 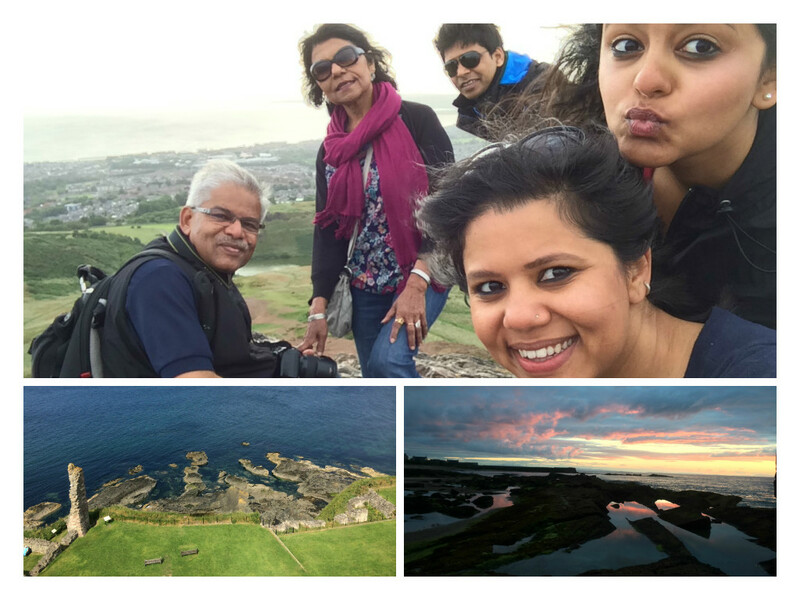 We explore the gorgeous landscape, whiskey distilleries, tiny untouched villages and sang Bollywood songs loudly while on the road! July 2014: I FOUND A JOB!!!!! yes, the excitement kicks in again. It’s my last-day-at-work day and the ‘twin’ and I have cried our hearts out. My heart aches at saying goodbye to a gem of a team but I know the next chapter would be something else. We make a pact to see each other’s faces every week (trust me! that still stands true today.) We have planned one monthly experience and million dinners. We plan to go for drinks and end up chatting till closing time. 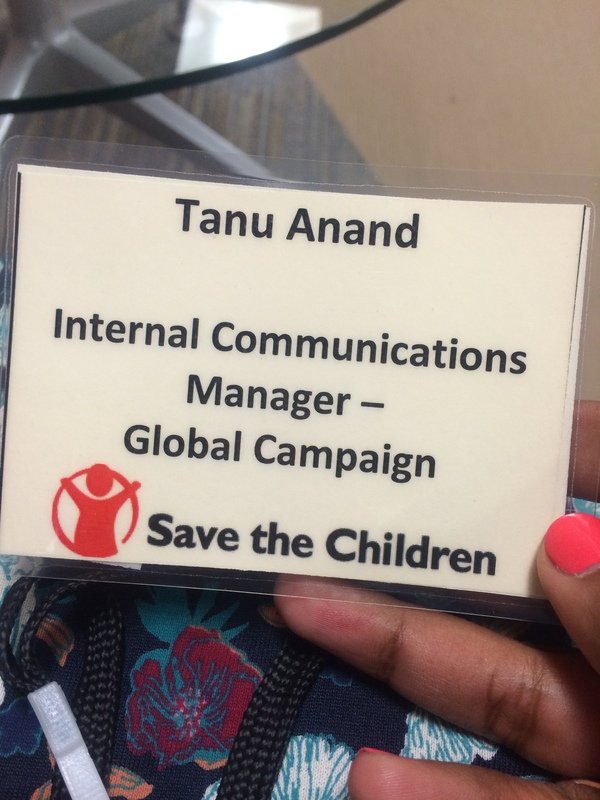 I work for Save the Children now. If I were to explain my first month here, it would be – I am physically thrown into a massive storm in Atlantic Ocean, with a small lifeboat at my mercy (symbolically this would be the husband and the girls from ex-office). My role is to swim to the shore battling the sharks and the weather gods. Too dramatic? Trust me, it is exactly how I felt. Never in my life have I experienced a work combination of “I want to quit now!” and “This is such an amazing opportunity”. Working on real world problems and crises, communicating stories of real-life heroes who save the lives of millions and reading about our work that brings a smile on that child’s face in Afghanistan… is a surreal emotion. 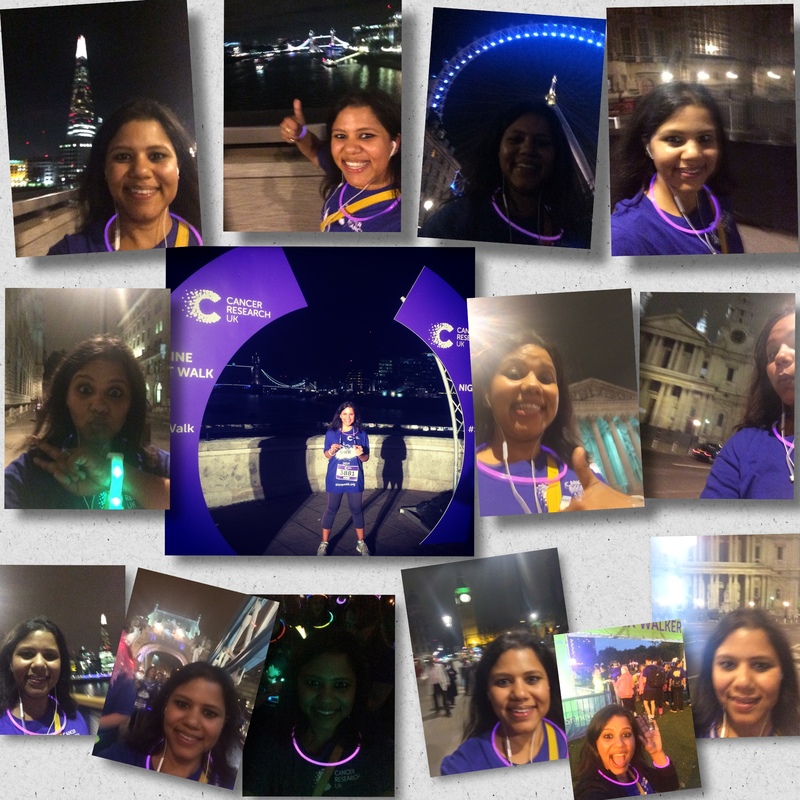 November 2014: I am running my very first 15k Cancer Research UK Shine Walkathon. So proud to not just contributing to a cause but also to do something off the ‘list’. Another thing ticked off the list – Went on a girls trip to Amsterdam… Had the best time of my life, missed the husband a bit (which is good!) but loved the unnecessary giggles, stupid photos and non-stop eating and drinking. I am finally at a place at work where I don’t want to pack my bags and run out of the door. I am looking forward to making 2015 a year that counts, not just for my career but also personally, as a human being. London continues to surprise me everyday and when I don’t ‘do something‘ for 5 days in a row, I get restless. But isn’t restless good? So here is cheers to many more adventures to come and a hope that my life is never the usual but filled with a million adventures.